“MH17 Pilot radioed that he was uncomfortable about the route he was flying before diverting over rebel-held territory.” http://www.dailymail.co.uk/news/article-2696975/Putin-blames-Ukraine-loss-Flight-MH17-298-innocent-souls-DOESNT-deny-Russian-separatists-shot-missile-McCain-warns-Hell-pay.html Malaysia Airlines has said “pilot was given no last-minute instructions” from them anyway. The Metro July 18 2014 carried a picture of interest to GovWatch. A photo at the bottom of the article shows ‘a man in an RAF uniform standing amid the debris of the crashed aircraft near the village of Grabovo Eastern Ukraine’. 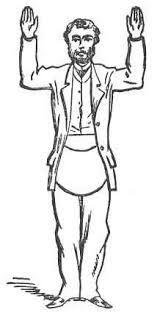 This person has both hands in the Masonic position for ‘help me’. Another photo at the top of the article has the caption “British passports among those found at the site.” They are asking us to believe that someone has been able to get into the still burning wreckage and recover – and sort – all those passports on the same day as the aircraft went down? 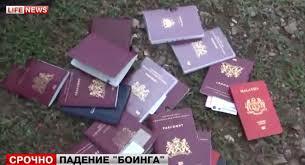 Furthermore, why are these passports not charred? TPTB always follow the same formula. Remember the miraculous appearance of passports at 9/11 site and after 7/7? They were in remarkably good condition considering the circumstances. It’s like a ptb signature don’t you think? Of course Field McConnell at AbelDanger has been following the MH17 incident very closely. He reports that the website Flightradar24 which he uses to ascertain take-off and landing info of commercial craft of interest to him suffered data interference from ‘the other side’ on 18 July 2014. Field’s comment about the MH17 full-scale facts Wiki entry being up so fast and then altered now further ‘explained’ by MSM. So Field the Ruskies altered it. http://www.independent.co.uk/news/world/europe/malaysia-airlines-mh17-crash-russian-government-agencies-accused-of-wikipedia-edit-blaming-ukraine-for-shooting-down-plane-9616536.html Well perhaps Israel WROTE it and someone else altered it. The propaganda war is really hotting up. GovWatch: There is no intention to trivialize air disasters and the terrible loss suffered by families as a result. We are just saying that this particular incident followed suspiciously quickly after a previous air incident from the same airline which had a good safety record. http://www.theguardian.com/world/2014/jul/18/malaysia-airlines-survive-mh17-disaster-mh370-disappearance Certainly tptb are showing air travellers what the risks could be after there was so much AM ‘Pooh Pooh’ about their MH370 fairy story..
“‘We need to know whether the International Civil Aviation Organisation was aware of a risk of flying in that airspace and, if it was, why it made the decision to allow flights. We also want to know whether Malaysia Airlines was specifically targeted.’” http://www.dailymail.co.uk/news/article-2698579/Two-cabin-crew-refused-fly-doomed-plane-war-zone-safety-fears-Senior-pilots-cabin-crew-flagged-concerns-flight-path-weeks-tragedy.html#ixzz37zlDt7sH Well some senior pilots were telling them it was risky, why didn’t they rule on it? What’s SERCO’s role in this? Well Field? Why were some bodies removed from the crime scene? They didn’t fit into the script? http://www.telegraph.co.uk/news/worldnews/europe/ukraine/10974050/Malaysia-Airlines-plane-crashes-on-Ukraine-Russia-border-live.html Stage is set. Finally ready for that world premiere performance fellas? Bring in the cameras and rollem! MORE PROOF MH17 WAS PART OF A SATANIC RITUAL!